Thanks to Wilsonso for inspiring me to make this trainer. 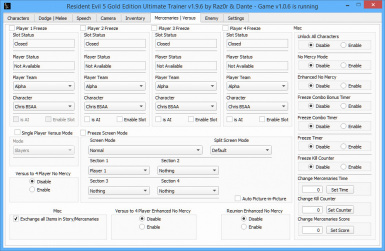 - Multiplayer model swap fix: Finally, you can play online with your favorite characters. Every door, elevator, lever will work. - Improved pause menu for Versus mode: Now the host gets to restart, quit or end local coop (in this case, it will pause the game. - Ignore Missing Files: Ignore any missing file, necessary for patchless character swap. - Fix Cutscenes: Static heads for characters during cutscenes. - Freeze Health: Does just that, freezes health. - Size/Speed: Change your char’s size or speed, check “Px Freeze Size/Speed” to change. - Move PLx to PLx: Copy and paste player x cords to another player. - Mission 3-2 Timer: Freeze timer in 3-2. - Full: Everything above, plus grapple attacks. - Remove handgun: Wesker only – removes handguns from the holster only for Wesker. Everyone – for everyone. - Always Show Weapon: Will always show weapons during melee attacks. Works ONLY if applied before level begins or after a restart. - Save/Load INI: Save and load melee settings. “Melee Swap” and “Swap Character Anims” must be checked in order to save/load settings. 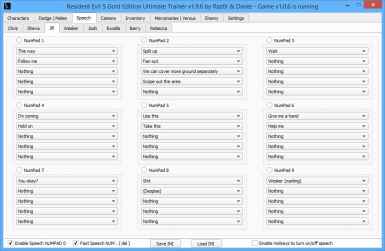 - Speech settings are saved for each character individually, use hotkeys when in game to alternate phrases. - Fast speech: No pauses between phrases. - “Freeze” checkboxes must be checked in order to change values. - Freeze cam 1, Freeze cam 2: Will freeze the camera, suitable for taking screenshots. Option 1 completely freezes the camera, while option 2 still allows for adjustments. - Advanced camera: Different camera values for different types of weapons. - Use Normal Camera Values for Aiming: The game will ignore aim camera values and use normal camera values instead. - Due to the fact that Story/Mercenaries slots and RTE slots differ, Rapid Fire/Infinite Ammo can only be set in “Real Time Editor” mode. setting anything but treasure to these slots is not recommended. - Enhanced RPG, Give RPG: give improved RPG with laser sight to a certain player, will occupy Slot 1 or Slot 2. - Save/Load INI: Save and load inventory loadouts. “Freeze” checkboxes must be checked in order to save loadouts. ONLY frozen slots will be saved. - Story Items: Set keys, emblems, slates, in other words, story-related items. “Freeze” checkbox needs to be set to actually edit these slots. 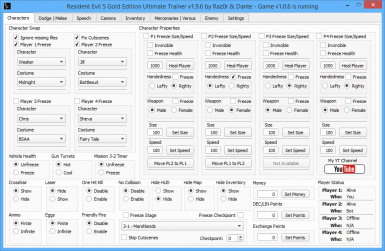 - Player x Freeze must be checked to enable editing of any slots. - Player Team: Here you can change your or other player’s team. - Versus to 4 Player no mercy: Converts Versus to 4 Player No Mercy Mercenaries, AI can also be spawned. - Exchange all items in Story/Mercenaries: Exchange any items between you and your teammate/partner in Story, DLC, Mercenaries or Versus modes. Doesn’t work for AI controlled teammates in Versus mode, hence will be disabled if your teammate is AI. - Unlock all characters: Use if characters in Mercenaries/Versus modes are locked. Should be enabled all the time if that’s the case. - No mercy mode: Enables “No Mercy” mode for Mercenaries in Duo mode. - Enhanced No Mercy: A hybrid of Reunion, No Mercy Mercenaries and Versus modes. Players can kill up to 700 enemies. - Reunion Enhanced No Mercy: A hybrid of Reunion, No Mercy Mercenaries and Versus modes. Players can kill up to 700 enemies. - Versus Enhanced No Mercy: A hybrid of Reunion, No Mercy Mercenaries and Versus modes. Players can kill up to 700 enemies. - Filter: Can be used to target specific enemies. If all 5 boxes are set to “Disable”, this particular filter will be disabled. - Kill enemies: Will set the health of enemies to 0. (Notice: Some enemies - bosses, dogs, spiders etc. won’t die if their health is at 0 points. - Move Enemies: Will move enemies to the character who’s currently under your control. has changed to 100/100). Values can be constant or random. - Jill’s device: Displays device’s current health. The health can be set or frozen. - Madness: Will trigger berserk state for some enemies. - Do Not Attack: Enemies will not attack selected players, they’ll be gathering around instead. - Wesker Boss No Time Limit: Fight Wesker until he runs out of health. - Wesker never Gives up: Use it with Enemies never die to prevent him from running away. - Enemies never die: Nothing can kill enemies, even headshots. - Don’t freeze magazine ammo for RTE slots: If you wish for the ammo to stay unfrozen, check this. 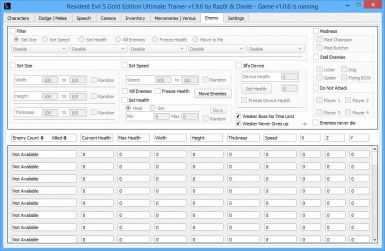 - Extended enemy trainer: For mods with increased enemy count (e.g. Nightmare mod). This mode can process up to 150 enemies simultaneously (50 by default). - Disable Rapid Fire: Will temporarily disable rapid fire for all weapons if you can’t disable it otherwise. - Disable Infinite Ammo: Will temporarily disable infinite ammo for all weapons if you can’t disable it otherwise. - Never Change Player Size: Use this in conjunction with player size modifier to force the game show the same size when your character is jumping, climbing ladders etc. - Freeze Z Coordinate: Will freeze Z coordinate (altitude) for the character controlled by you and/or another Ai controlled character. if proper patch has been installed. your character might or might not dodge. To fix this, either use the original successive dodge or just reenable dodge and this version of successive dodge. 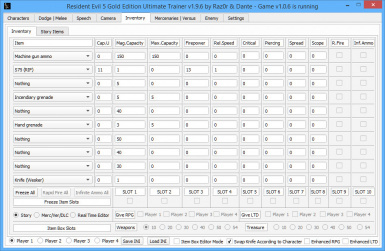 - RTE Slots: Enable rapid fire and/or infinite ammo for RTE slots 11 and 12. - Not-So-Dying State: Your character won’t die on his own after getting critically injured. In addition, the use of weapons is enabled. - TPS (third person shooter) Mode: When this mode is enabled, your character can pick up items, place mines, shoot, reload, heal almost instantly. - Reset Enh.Merc/Ver Score: The score will be reset as soon as 700 enemies have been killed or time has run out. ONLY Enhanced Mercenaries/Reunion/Versus and Versus No Mercy modes are supported. - Dodge Anim Swap: Replace dodge anims with the anims of your choice. 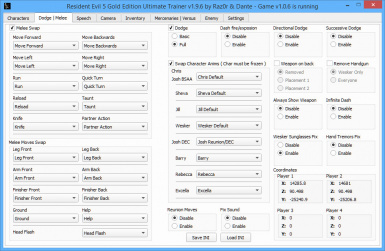 WESK(WESKER) checkbox will enable anim swap only for Wesker, other characters will continue to dodge normally. - Different Coords: Makes the coordinates more precise, useful for modders. - Pathfinding fix: Improves enemy pathfinding (running in circles, jumping down). 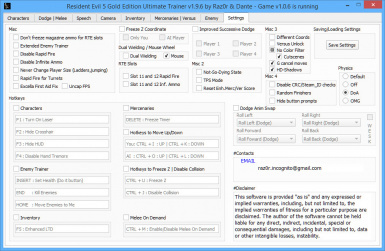 - Disable CRC/Steam_ID checks: Allows you to use any save file you find on the internet. - Random Finishers: Random finishers in Versus mode. - Mouse/Mouse Wheel: Allows you to use your mouse wheel to change weapons. - Hide button prompts: Hide most of the button prompts. Cutscenes are not affected. - Saving/Loading Settings: When you’re done playing around, you should save the changes you’ve made. Settings are loaded during trainer startup.